Every Wednesday, Paula Colman drops off her kids at school and then drives up Little Cottonwood Canyon, where she hits the slopes for a few hours with other outdoorsy mothers. Colman (pictured far right) is part of SkiMums, a free meetup group for intermediate/advanced women skiers. 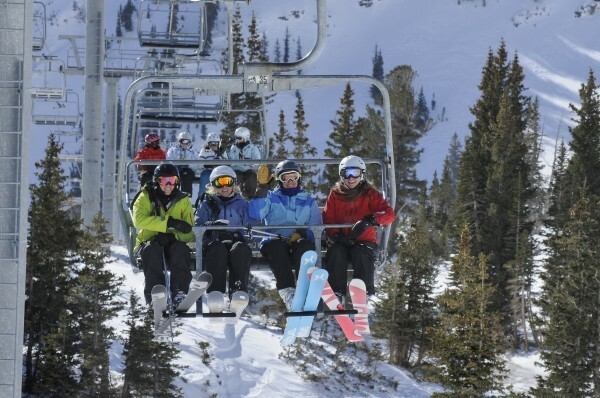 They meet weekly on Wednesdays at 9:30 a.m. at the Gadzoom Lift at Snowbird Resort (9600 E. Little Cottonwood Canyon Road, Snowbird, 801-933-2222, Snowbird.com) to carve a little time out for themselves. Visit SkiMums.com for more info. The answer is simple: We live in Salt Lake City, home of the Greatest Snow on Earth, and skiing is a heckuva lot more fun than Bunko. When our friends in other states hear about SkiMums, they get really excited and then really quiet. Yeah, we have to watch what we say so they don’t get jealous and will continue to speak to us. When did you decide to start SkiMums? A few years ago, several local women figured out that if they set aside a certain day of the week to ski, they were actually able to pull it off. Last year, we called Snowbird telling them that they had a group of local women skiing there every week, and—pretty cheekily, looking back—asked if we could have some free hot chocolate. Snowbird figured out pretty quickly that this sounded like a lot of fun—which it is—and that other local women would love to do it, too. What about women who don’t think they have the time for this? We all need to carve out time for ourselves. Women and mothers, in particular, sometimes have a tougher time doing that. Whether they work inside or outside the home, women—sorry to generalize here—tend to fill every last moment with giving to their family, job, church, community and, then, perhaps themselves. However, all the research says that if they don’t recharge their batteries, they’ll do a poor job at the rest of it. Getting outdoors, breathing fresh air, getting exercise, socializing—that’s what makes people function better at home, at work and in the community. With a ski resort as close as the mall, Salt Lake women can get away for even an hour to accomplish these things. SkiMums is just a nudge to allow you to make it happen. Do you think that SkiMums makes you a better mom? Any time we give a little to ourselves, we’re able to give more to others. SkiMums gives women “permission” to play hooky for a few hours. Beyond that, being outside, standing at 11,000 feet above sea level on Hidden Peak, looking into the morning sun, and zooming into Mineral Basin with others cheering you on can only make you feel better and be a better parent, spouse and human being. Trying a new run, fresh powder or something a little steeper than you’ve tried before gives you a rush and a confidence that most women don’t experience on a regular basis—although carpooling is a close second. There have been some great stories this past year: One Skimum’s spouse bought her new skis to encourage her to ski powder; there was the backcountry-only husband who bought a family pass for the first time in 15 years because his wife had so much fun with SkiMums last season; the missionary son who made his mom promise to ski with the Mums while he was away. So, there is a working theory that SkiMums come home in a really good mood! Had you forgotten how to ski because you were snowplowing behind your kids while teaching them? SkiMums is aimed at intermediate/advanced skiers at Snowbird so, it’s doubtful that these women have “forgotten” how to ski. It’s just that many haven’t had the opportunity to blow through powder on Tiger Tail in a while. Our weekends have been filled (and, for many, are still filled) with getting the kiddos on and off the mountain and—believe it or not—some women don’t ski their best with their “just-ski-Upper-Cirque-without-turning” spouses. Carving out some time to ski with other women on Wednesdays, SkiMums can work on their own skills at their own pace—often with a lot of laughter. What do you guys chat about on the lifts—is it all about motherhood? What happens on the mountain, stays on the mountain! We’re women—we talk about everything. The SkiMums blog is developing into a forum to address ski-related issues from gear to fear to what to eat at MidGad. We’re locals and tend to share info that we find interesting or amusing. One thing we’ve discovered is that compared to the vacationing skier, we actually know quite a bit about skiing and where to find the best resources or bargains in the area. It’s fun to share that with others, although we might be doing too good a job and have a few out-of-towners that now want to move here. What we’ve also discovered is how little we know or take advantage of what’s available at Snowbird, especially if you have a season pass. The blog has been a good opportunity to discover the place anew and check out some of the food, lessons and deals available. Also, we’re planning to post a bunch of SkiMums’ favorite slow-cooker meals after confessing on the lifts one day that it was our “cheat” to staying on the slopes longer (dinner is already done! ).